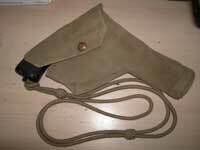 The Web Equipment, Naval, Pattern 1919 Water bottle carrier was introduced with the Pattern 1919 Naval Web Equipment in List of Changes L. of C. §23254, dated 2nd October 1919. It is identical to the W.E.I.O. 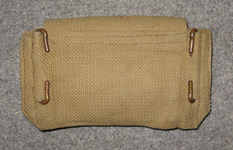 Water bottle carrier, except for the finer weave of the officers' version, and very nearly identical to one version of the later Pattern 1937 Water bottle carrier. It is made of 1-inch web, with two 1-inch Twigg buckles and a ¾-inch strap that snaps to a stud on the front cross piece. 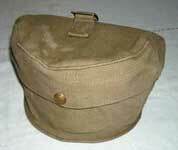 There were no changes to the Pattern 1919 Water bottle carrier during its service life. From the Martin Brayley Collection, photographs © Martin Brayley 2010. 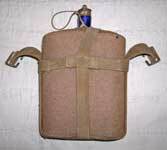 Another example of the Pattern 1919 Water bottle carrier. 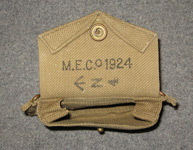 This Carrier, from the Chris Pollendine Collection, is maker marked "M.E. Co." and dated 1940. It is not naval marked. KW have observed quite a few pieces of late dated W.E. Patt. '19 that, like this one, are not naval marked. The Web Equipment, Naval, Pattern 1919 Pistol case was introduced with the Pattern 1919 Naval Web Equipment in List of Changes L. of C. §23254, dated 2nd October 1919. It is designed to take the large frame Webley revolvers. 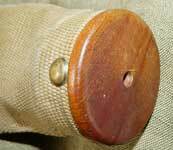 It has two double hooks on the rear to fit the Pattern 1919 Waist belt, is lined with smooth webbing, and it has a round wooden plug at the bottom (see detail at right). The 1st issue Pistol case does not have a sleeve (or loop, as it was officially called) for a cleaning rod. KWRT is not sure when the wooden plug was changed to a full web base; we have not found any instructions or L. of C. entries to this effect. If we assume that this was done at about the same time that the plug disappeared on the Holster used in W.E.I.O., then it would have been c. 1933-35. This example, from the Chris Cone Collection, is maker marked "M.E. Co." and dated 1924. Photographs © Chris Cone 2009. An interesting and educational example of manufacturing tolerances. Both of these 1st issue Patt. '19 Pistol cases are "M.E. Co." marked, naval inspection marked, and dated 1930. As you can see, though, one is ½-inch shorter than the other. Both from the Jeremy Lloyd Collection, photographs © Jeremy Lloyd 2012. As mentioned above, no documentation has been located that shows when the wooden "sewing reel" at the base of the Pistol case disappeared, and the Case became all web. Our best estimate, as noted above, is that this was circa 1933-1935, but Karkee Web would very much like definitive information on when this took place. 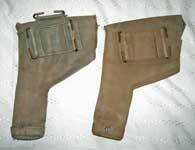 The second issue W.E., Naval, Pattern 1919 Pistol case shown at left looks almost identical to the W.E. Patt. '37 Pistol case, but naval marked and without the third, horizontal double hook on the back side. As with the Patt. '37 Case, it has an internal sleeve for the cleaning rod. 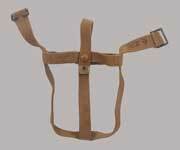 From the Tony Cone Collection, this holster is maker marked "M.E. Co." and dated 1938. Photographs © Tony Cone 2009. Another example of the 2nd issue Pistol case. This Case is maker marked "M.W. & S. Ltd." and dated 1941. This is unusual, as all of the other identifiably British made Patt. '19 items we've seen have been made by Mills. It's not a khaki Patt. 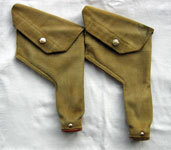 '25 Holster, pistol, which we considered as a possibility.That version had an external cleaning rod pocket on the rear (located differently than the one of the 3rd issue Patt. '19 Case, pistol), whilst this one has am internal sleeve. This Case is not naval marked, but we have observed quite a few other late dated Patt. '19 pieces that were not naval marked either. From the Chris Pollendine Collection, photos © Chris Pollendine 2011. An illuminating comparison of the 2nd issue Patt. '19 Pistol case and a W.E. Patt. '37 Pistol case. As can be seen from the photo far left, the two Cases are almost exactly the same size. The location of the crown fastener spigot, though, is different. As a result, a Webley Mk. VI fits well into the Patt. '19 Case (centre left), but the Patt. '37 example won't snap closed over the same pistol (near left). Both Pistol cases are from the Chris Pollendine Collection. The Patt. '19 Case is the same one shown above; the Patt. '37 Case is maker marked "M.E. Co." and dated 1940. Photos © Chris Pollendine 2011. Just as he did with 1st issue Cases above, Jeremy Lloyd is once again illustrating manufacturing tolerences, this time with 2nd issue Pistol cases. As can be seen, the example far left is about ½-inch shorter than the other two. Both from the Jeremy Lloyd Collection, photographs © Jeremy Lloyd 2012. 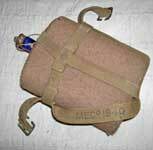 The Web Equipment, Naval, Pattern 1919 Cartridge pouch was introduced with the Pattern 1919 Naval Web Equipment in List of Changes L. of C. §23254, dated 2nd October 1919. 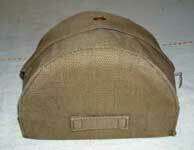 It is designed to carry ammunition for the pistol. 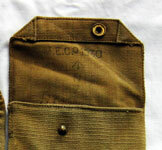 It has two double hooks on the rear to fit the Pattern 1919 Waist belt. This is the first example KW has seen of an unmodified 1st issue Pouch. The internal flaps are 1-inch by 1-inch and are stitched to the sides and into the back of the pouch. From the Graham Tweeddale Collection. Photographs © Graham Tweeddale 2013. 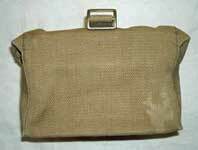 The design of the Pouch, cartridge was amended by List of Changes L. of C. §A6828, dated 29th April 1932, which added a strip of web across the top of the Pouch's opening, to keep loose cartridges from falling out. This new feature can be seen in the blancoed 2nd issue example at left. It is maker marked "M.E. Co." and dated 1940. From the Karkee Web Collection. This 2nd issue example is maker marked "M.E. Co." and dated 1942, but is not naval marked, which suggests possible army use. From the Karkee Web Collection. 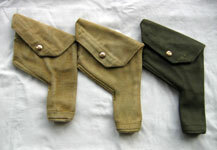 Khaki Pouches, identical to the Patt. 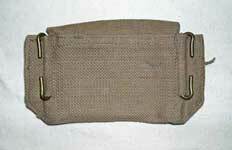 '19 Pouch, may have been used by the Army to carry the Sten loading tool. Additionally, the Patt. 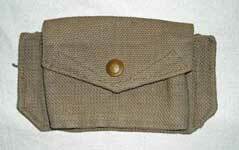 '25 Pistol cartridge pouch is identical to the Patt. 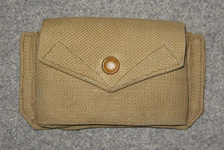 '19 Cartridge pouch except for colour. The Web Equipment, Naval, Pattern 1919 Frog was introduced with the Pattern 1919 Naval Web Equipment in List of Changes L. of C. §23254, dated 2nd October 1919. This Frog's description in the List of Changes states that it is designed to take a Bayonet scabbard. The Mills Company Fitting Instructions, though, describe it as a Cutlass frog, as do the official instructions given in the1940 printing of Royal Naval Handbook of Field Training, 1934. The loops are larger than those on a Patt. '08 Bayonet frog. 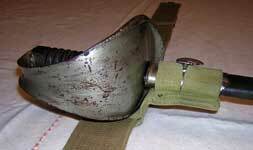 It can be used with either the Pattern 1888 or Pattern 1907 Bayonet scabbard, although the fit is slightly loose. The scabbard for the Sword, Naval, Pattern 1889 | Cutlass,steel hilt, is a good fit, where it would be very tight in the Pattern 1908 Frog. It must be noted, however, that in actual use with the Patt. ’89 Cutlass the Frog is awkward. As seen in the pictures, the bell of the cutlass hilt causes the sword to hang uncomfortably. The Fitting Instructions make it clear that this frog was intended to carry the Patt. 1889 or Patt. 1901 Cutlass, but it must be said that the Mills Company’s usual care in design appears to have fallen a bit short of the mark here. This particular Frog is maker marked "M.E. Co." and dated 1924. Also note the two rivets at the top of the loop. The head of one is broad arrow marked, while the other has the naval "N" stamp. The Pattern 1889 Naval Cutlass is maker marked “ENF” for RSAF Enfield and is dated 1891. 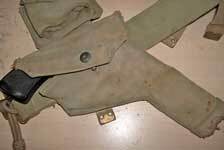 There is also another, different type of Bayonet frog to be found in the Mills Pattern 1919 Rifle Equipment. That Frog is identical to the later Pattern 1925 Frog, and is illustrated in the section on Pattern 1919 Rifle Equipment. From the Karkee Web Collection. 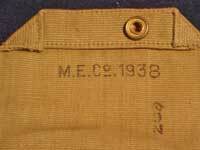 The Web Equipment, Naval, Pattern 1919 Mess tin cover was added to the Pattern 1919 Naval Web Equipment in List of Changes L. of C. §24857, [no date but c. 1921-22]. Prior to the introduction of this Cover, the mess tin was carried strapped to the Pattern 1919 Rucksack, but it was either uncovered or in the Mk. I Naval Mess tin cover introduced with the Naval Pattern 1901 Accoutrements. In either case, it was necessary to unstrap and remove the Mess tin to access it. This Cover is designed so that the strap attaching it to the Rucksack passes behind the Mess tin rather than over it, while still providing it full support. 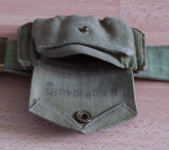 This allows the Cover to be opened and the Mess tin removed and replaced without removing the cover from the Rucksack. It appears that, although officially entered into the L. of C., this Cover was not widely used. Karkee Web has not seen a contemporary photo if it in use, and the photos in the 1940 printing of Royal Naval Handbook of Field Training, 1934, still show the canvas Mk. I Naval Mess tin cover. This example is maker marked "M.E. Co." and dated 1924. From the Karkee Web Collection.